Figure 1. Castor bean plant. 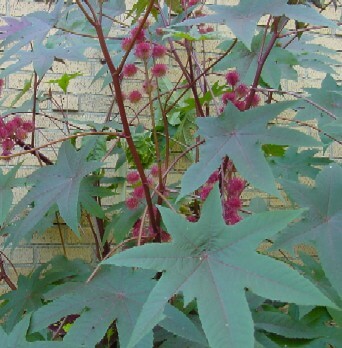 Source: www.library.illinois.edu/vex/toxic/castor/8-29-13.jpg. 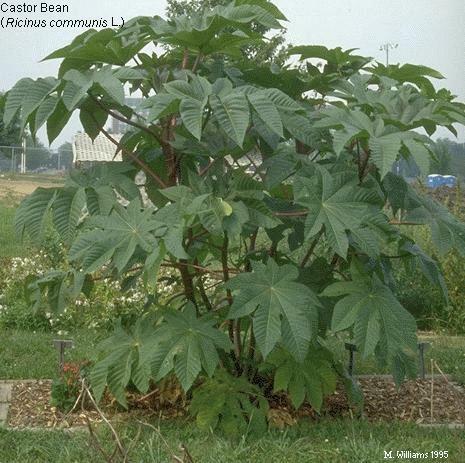 Castor bean (Ricinus communis L.) has been used for many years as an industrial oilseed crop because of its high seed oil content ( ~50%), unique fatty acid composition (high in ricinoleic acid)and lubricity, potentially high oil yields (from <100 to >250 gallons/acre have been reported), and its ability to grow under varying moisture and soil conditions. 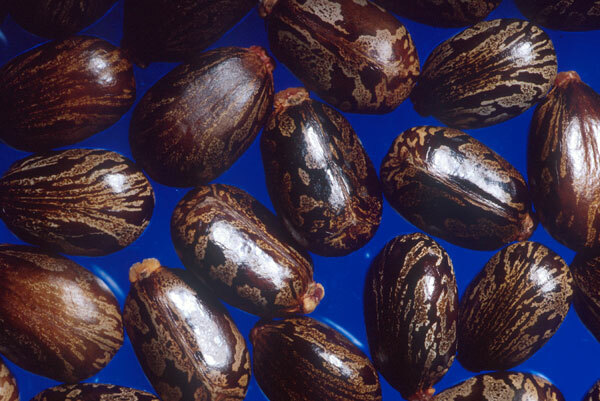 Castor’s use is limited to some extent because the unprocessed seed contains a highly toxic protein—ricin. 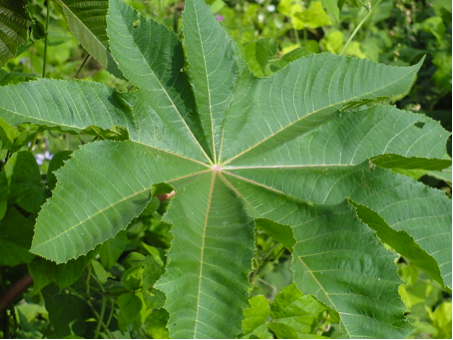 Nevertheless with appropriate processing and handling along with new efforts to breed ricin-free seeds, castor holds promise as a biodiesel fuel along with its current industrial and pharmaceutical uses. Figure 2. Castor bean leaf. Photo: Thamizhpparithi Maar; Wikimedia Commons. Figure 3. Castor bean flowers. Source: Thomas Ombrello, UCC Biology Department, http://faculty.ucc.edu/biology-ombrello/POW/castor_bean.htm. Figure 4. Castor beans. Photo: ARS/USDA; Wikimedia Commons. E.A. Weiss. 2000. Oilseed crops. 2nd ed. Blackwell Science, Oxford. Dias, J.M., etal. 2013. Biodiesel production from raw castor oil. Energy. 53: 58-66. Skrirame, H.Y., N.L. Panwar, and B.R. Bamniya. 2011. Bio Diesel from Castor Oil- A green energy option. Low Carbon Economy. 2:1-6. Moshkin, V. 1986. Castor. A.A. Balkema. Rotterdam.